Published on 27. August 2018 by FG ArtTavelint. 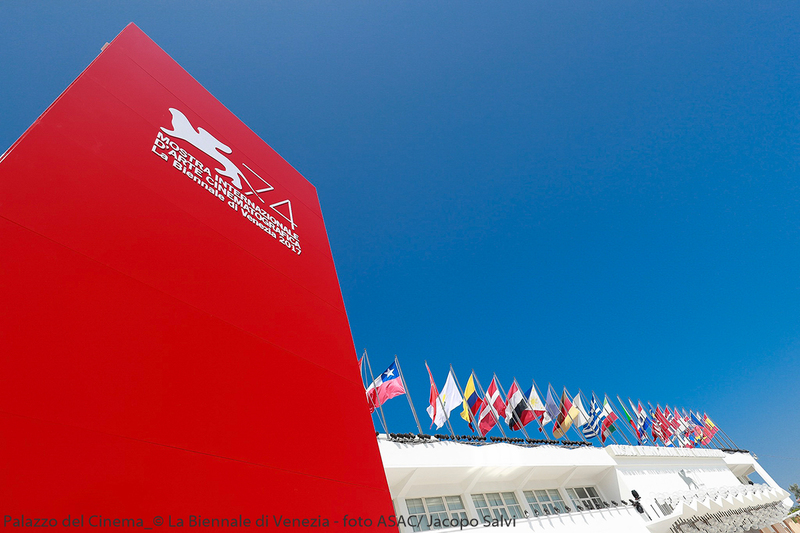 The 75th Venice International Film Festival is organised by La Biennale di Venezia, and will take place at Venice Lido from August 29th to September 8th, 2018. 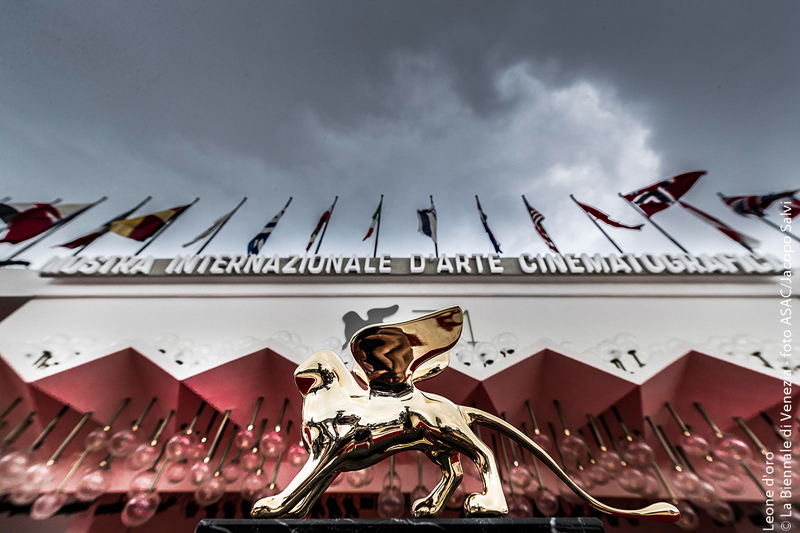 The Festival is officially recognised by the FIAPF (International Federation of Film Producers Association). 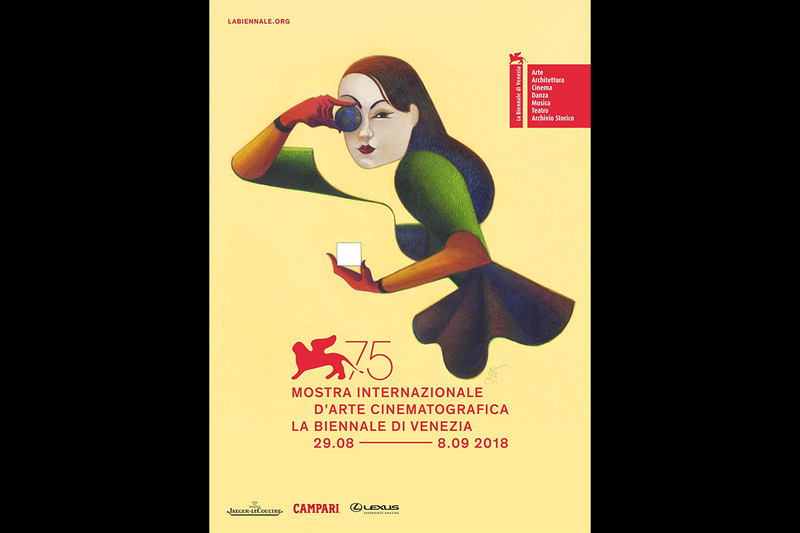 Italian illustrator and comic artist Lorenzo Mattotti is the author of the new official poster of the 75th Venice International Film Festival of the Biennale di Venezia. „I believe that a poster must have something intriguing about it, that attracts the eye, that attracts thought, but without revealing too much. It needs to have a sort of enigma, a sort of mystery to solve. After various attempts, I developed this idea of a girl – explained Lorenzo Mattotti – of this female character – with a very graphic, unrealistic face – who looks with a rather serious expression through a lens. And instead of this lens, there’s Earth, planet Earth, symbolizing a gaze directed at us. Then there is a white square, and I believe that this combination is a successful match, because people wonder: what is that white square? I believe it is natural to think of it as a movie screen, the white screen. The gaze directed on the planet, directed on reality, must pass through this device, must be filtered through the screen“. Lorenzo Mattotti lives and works in Paris. He began his career in the late 1970s as a comic artist and in the early 1980s with other illustrators founded the Valvoline group. In 1984 he made „Fuochi“ which was greeted as an event in the world of comic art, and won important international awards. In cinema, he collaborated in 2004 on Eros by Wong Kai-Wai, Soderbergh and Antonioni, and was responsible for the presentation segments of each episode. He was a creative consultant for Pinocchio by Enzo D’Alò and is working on his first animated feature-length film as author and director of La famosa invasione degli orsi in Sicilia, inspired by the fable/apologue by Dino Buzzati. In „Incidenti“, „Signor Spartaco“, „Doctor Nefasto“ „L’uomo all finestra“ and many more books, all the way to „Stigmate“ published in Italy by Einaudi, Mattotti’s work has evolved as an extremely coherent constant. Today his books are translated around the world. He publishes in newspapers and magazines such as The New Yorker, Le Monde, Das Magazin, Suddeutsche Zeitung, Nouvel Observateur, Corriere della Sera and Repubblica. He has illustrated many books for children including „Pinocchio“ and „Eugenio“, which won the Grand Prix in Bratislava in 1993. He has held many solo exhibitions including an anthological exhibition at the Palazzo delle Esposizioni. He makes posters, covers, advertising campaigns and was the author of the poster for Cannes 2000 and the posters for the Estate Romana festival. 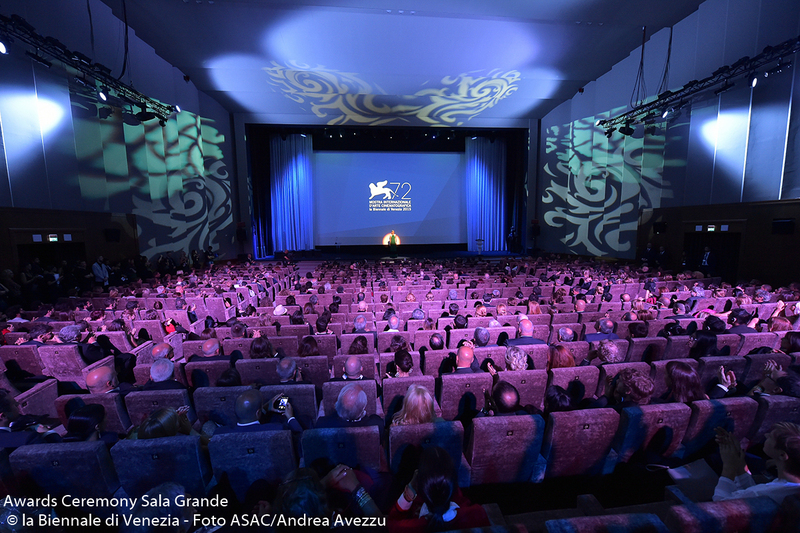 The most common metaphor for describing a festival program is to call its collection of movies “a snapshot of the present.” In other words, it is a way to represent the state of health – or our impression of it – of worldwide film productions, in a precise moment and historical context. We can deduce how approximate this definition is by comparing a festival’s selection with its previous program or that of the following year. Different conclusions can be drawn from the different configurations of each program, and these conclusions often contradict each other and are occasionally glaringly wrong. A good selection (which, like a less successful one, is always the result of subjective choices and much conditioning), could give the idea that cinema is in perfect health. Or just the opposite, without either of the two conclusions being necessarily inaccurate. The fact is (to use the language of quantum mechanics), quite simply, the present doesn’t exist. According to post-Einsteinian physics, the past and the future no longer oppose each other (as was long believed), separated by a third time period which supposedly corresponds to “now”: scientists say this concept doesn’t mean a thing. “World events do not queue up like the British. They mill around like the Italians,” as Carlo Rovelli ironically noted. To continue the opening metaphor, we should probably note that the “cinema of the present” is a meaningless phrase. For example, there are directors and producers who continue to make movies the way they were made in the last century, and others who instead follow unusual methods, experiment with new languages and narrations, create new media. Not only should we accept the idea that they can legitimately coexist. We must. For the simple reason that it isn’t that things “are”: things happen. To quote Rovelli once again: “People can believe that the world is made of things. Of substance. Of entities. Of something which is. Which remains. Or they can believe that the world is made of events. Of incidents. Of processes. Of something which happens. Which doesn’t last, which is a continuous transformation.” Now, try substituting the word “world” with the word “cinema.” In our case, too, this change of perspective is fascinating. To consider cinema a collection of events, of processes, helps us to better grasp it, comprehend it, describe it. A few examples? If we stop believing in a before and an after, in keeping with a linear and progressive logic, we realize that it is useless to compare the cinema of the past with the most recent cinema (or even better, with tomorrow’s). It is useless to complain that today’s movies aren’t as beautiful as yesterday’s, as though some form of original purity had been lost through their diversity. Or to refuse to accept the changes brought about by technological transformations, the digital revolution, or changes in the market. We must take account of the events which are chaotically milling around: we are often tempted to downplay this confusion, to address it with the tranquilizing expression “transition period” (as though we weren’t constantly transiting toward something else: other experiences, other images, other visions). And this might be the best description of the work which lies behind this festival. Other festivals might have different objectives: to define what is good cinema and what isn’t, for example. But what if it were more important to describe it, to try to comprehend it, to grasp its fertile contradictions and irreducible complexities, instead of establishing temporary hierarchies? To proceed by inclusion instead of dogmatic distinctions, to broaden our gaze instead of only focusing selectively, to go beyond the limits instead of raising barriers? Without renouncing quality, or better, without ceasing to constantly question what it is and where it resides today, in this present which they tell us doesn’t exist, in a universe which is no longer the past and not yet the future. Of cinema, of course.